Today’s Nice Price or Crack Pipe 323 GTX stems from a model line that once was boasted as being a Great Little Car. It’s up to you to determine if this potentially rabid rally car - and its price - lives up to the hype. In a shocker so big that your local TV news would save its reveal until after the commercial break, yesterday’s 1986 Caddy Cimarron D’Oro fell in a decisive 81% Crack Pipe loss. Cavaliers everywhere pointed and laughed at its shame. Did you know that rally racing once was as easy as A B C? Yeah that's right, it was as simple as do-re-mi, 1-2-3, baby, you and me girl. . . Sorry about that. But it is true, the Alphabits designation for rally cars defined different classes and hence the individual specifications and rules for the FIA series. Introduced in 1982, Group A was the milquetoastiest of the three classes and was intended to encompass modified touring cars, or more succinctly production cars that were lightly beefed up for their competition job. In order to qualify for the series, a number of production models had to be built - 5,000 minimum - which was called Homologation, or in layman’s terms, “becoming the gehz.” Mazda's a company with racing in their blood and seeking to become a Group A star with a reasonably paced car, in 1986 they debuted the 323 GTX. Mazda brought the turbocharged 4x4 hot hatch to North America two years later, and this black beauty happens to be a Canadian example. From the factory these cars had a pumped up edition of the B-series four cylinder and 132-bhp. On this particular car that mill has been replaced with a rebuilt 1.8 edition with enough performance enhancements to get it suspended for 50 games by the MLB, but probably makes the car a hell of a lot more entertaining to drive. It's all claimed to have been professionally done and the engine bay doesn't look any more whackadoodle than normal. The car's exterior has also seen some mods including a primer painted hood that is holier than thou, and a JDM front bumper cap. The stock wheels seem to be missing their center-caps but nicely the stepped rubber spoilers on the hatch are intact. Oh, and Yakima rakima! As far as the rest of the GTX's mechanicals go, a five-speed stick sends power to all four wheels through a manually locking planetary diff, and each corner is independently sprung and gets a disc brake to call its own. Adding to the stopping on this one are what are said to be some monster brakes, also from the market known as after. It may not seem so just by looking at it, but from the factory the GTX was really a far different car from the block-stock 323 three-door. The hotter hatch featured a wider track, redesigned floorpan and sill reinforcements, all which served to the hard charging all-wheel drive rally aspirations. 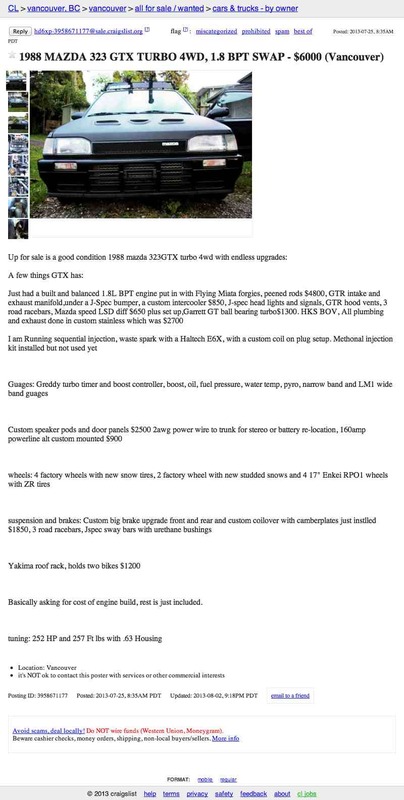 The ad offers no interior shots, but does note that along with the engine, the car's sound system has been upgraded, to which I say whoop-dee-freakin'-doo. With what the seller is claiming to be 252 hp, I doubt anyone would want to waste time listening to anything other than the sound your right foot creates. Mazda planned to sell quite a few of these cars over here, but their initial high price when new quelled demand. In the end not many were sold, and today they seem rarer than hen's teeth. At a $6,000 asking price, the seller of this one isn't really playing on its rarity. Instead he's making the claim that you're really buying all the work that has gone into the engine, and that you're getting the rest of the car for free. I don't know about that logic, but I do know that it's now time for you to pass judgment on this GTX and its six grand price. 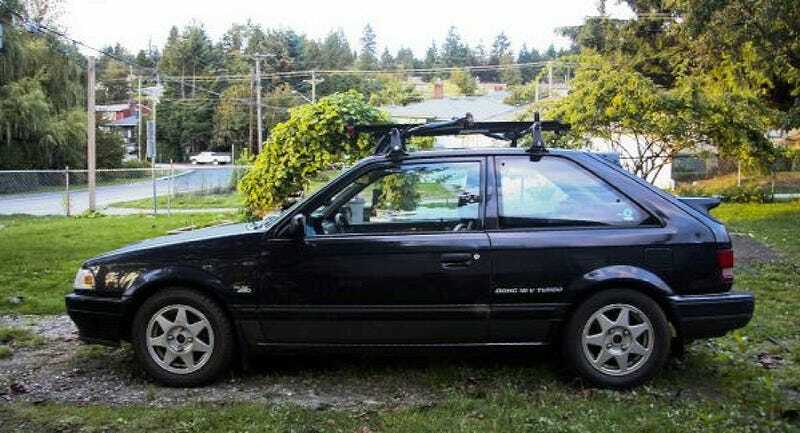 Do you think that's a square deal for this modded rally aspirant? Or, is that too much for this Group A car and you'd just rather wait for the Groupon? A blip of the throttle to usingthegasyourhybridissaving for the tip!